Harriett Baldwin spoke out this week at a packed Countryside Alliance meeting in favour of better flood defences for Tenbury Wells. At the meeting were Peter Ainsworth, Shadow Secretary of State for the Environment, Andrew Pierce from the Daily Telegraph and John Gummer MP. 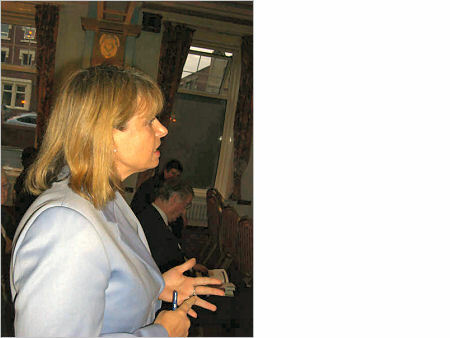 Harriett Baldwin said, "Can I give the people of Tenbury Wells an assurance that a Conservative government will look once again at the Environment Agency's formula for flood defences, so that we avoid a situation where Tenbury Wells can be badly flooded three times and still not qualify for a full flood defence scheme?" The panel agreed that the formula was not the best way to approach the problem and that smaller market towns like Tenbury Wells deserve better flood defences. Photo: Harriett speaks out at a packed Countryside Alliance meeting in favour of better flood defences for Tenbury Wells.